Was the death, the destruction, the displacement worth trying to unseat a regime? Fares tried to tell the audience, and an increasingly inattentive world, why it was. In the years since the uprising, the reasons for it have been forgotten, overtaken by raw survival and the logistics of displacement and exile. Many who tried to propose a new politics for Syria have been killed, as Fares was last week, gunned down by masked men. The multitude of ideas birthed by the Syrian revolution, ideas about what Syria was and what it could be, have been replaced by a focus on security and stability. The Syrian civil war has left no room for politics, except for those who wield guns. The pro-democracy movement of which Fares was a part of is being dismantled, one broken body and one destroyed town at a time. More than a personal tragedy, the killing of Raed Fares demonstrates how a specific idea of the Syrian revolution is literally dying out. The Syrian revolution, like all the uprisings of the Arab Spring, was first and foremost a revolution of ideas. There was a brief moment when all sorts of ideas for the future of Syria were put forth, from liberals who wanted egalitarian policies toward gender and ethnic communities, to conservatives who desired a greater space for faith in politics. The reality of years of war eroded that. The unrelenting harshness of life under siege, assaulted by bombs and guns, in many places without adequate food or electricity, shifted the focus from the political to the personal. Too many were only able to focus on themselves, their families and their immediate surroundings. Ideas of political change melted away. Those who wanted different ways of doing politics inside Syria became shadows, exiled, exhausted or, like Raed Fares, dead. Groups that had genuine political ideas about the future of Syria disbanded or went into exile. The pro-democracy movement of Fares was decimated, in his case confined to the small town of Kafranbel, but in the case of others existing on the margins in Istanbul or Berlin. Security and stability became the focus. The conflict was depoliticized. It is noticeable that no one, from the United Nations, through the Russian and Turkish governments that have been so involved in the conflict, to the Western powers that have been largely absent, now talks of a political solution for Syria. There is no room for politics, only the language of security. Security means the Syrian situation returns to where it was before the uprising, when Syria was one of the few places in the Middle East not to have civilians die in a terrorist attack. It means returning to a Syria without politics, when the regime decided everything behind closed doors and the people accepted that in return for stability. It means depoliticization of the conflict, where the focus is on ending the war without any concern for the shape of the political settlement that follows. The only two groups who still talk politics, who have a vision of what Syria could be after the war, are the regime and the Islamists, not uncoincidentally the only two groups with the guns to fight for their political ideas. And it’s precisely this crossfire that cost Fares his life. 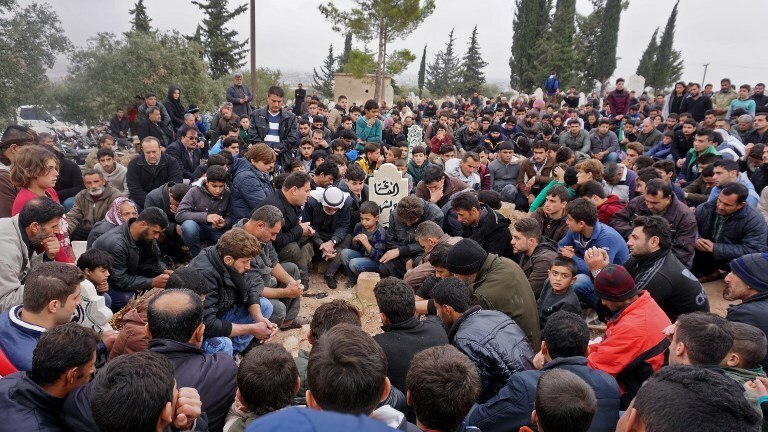 Inside Idlib province, the last population center beyond the reach of the regime, a war is taking place between Islamist groups, predominantly the former Al Qaeda affiliate Hayat Tahrir Al Sham, and any other opposition. For now, the demilitarization agreement negotiated by the Turks and the Russians is holding, but no one believes it is a long-term solution. Sooner or later, there will be a showdown inside the province, and the Islamist groups have made it their objective to wipe out any other opposition in preparation for that moment. The Islamists want to ensure they are the only viable alternative to the regime or Turkey, to the boot of Damascus or the occupation of Ankara. That way the population, squeezed between two unpalatable alternatives, might accept their presence. The day after his funeral, banners were flown in Kafranbel that read: “It may appear that they killed you, but you are still with us as an inspiration.” The best way to honor and remember activists like Fares is for those who come after to hold fast to the ideas of democracy and civil society, remembering them, building on them and trying them out, even when surrounded by the siren calls of security and stability. There is still a space in Syria for politics, for a real debate about how the society is organized. But it will have to be conducted in the midst of those who use guns to promote their own ideas, and who are seeking to literally kill off any alternatives.